Announced since mid November 2009, in February 2010 a new vinyl album was released: Mysterious Semblance At The Strand Of Nightmares comes as a 180g vinyl LP with an additional CD containing the same music. It is packed with an Obi strip down one side of the LP sleeve. The package is created by Lilith Records, a Russian reissue label that since 2004 has re-released a number of Rock albums on 180-gram vinyl and compact disc for Western markets. The label about the release "Highly influenced by artists like Salvador Dalì, Tangerine Dream began life as a kind of surrealism in music. After having sold off all of their 'traditional' music equipment, the Berlin-based band began using strictly electronic devices like synthesizers, sequencers, Mellotron, Moog as well as other self-built toys. These rare recordings trace the band from this initial experimental period (1972), through to commercial success with Virgin later on in the decade." 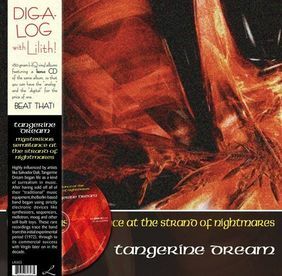 This compilation does not contain any new material; in fact, all music has already been released on The Electronic Magic Of Tangerine Dream (2008). The remaining tracks from that album were later released on a similar LP/CD release, titled Run To Vegas (2010).